There is a serious water crisis for the majority of the population of our planet that is responsible for the death of hundreds of thousands of men, women and children each year. While most of the earth surface is covered with water, only a very small fraction, an estimated at 1% - 3%, of fresh water is suitable for human consumption and of that fraction, only a small amount is actually available for human consumption. Clean water is taken for granted by most people in the most developed countries of the world, but in developing countries (two thirds of the world), clean, safe water is scarce or unavailable. Nearly one billion people live without reliable, clean drinking water. The effects are devastating for the people and their communities who lack access to clean water. Did you know that world wide, more than 500,000 children die every year from unsafe water and poor sanitation? That is over 1,400 children every day…. Up to 80% of all illness in developing countries is linked to poor water and sanitation conditions. About half of the world’s hospital beds are occupied by a person suffering from water related disease. Many children living in rural villages and orphanages in the developing world, suffer and/or die from water related diseases, this is completely avoidable with relatively simple solutions. 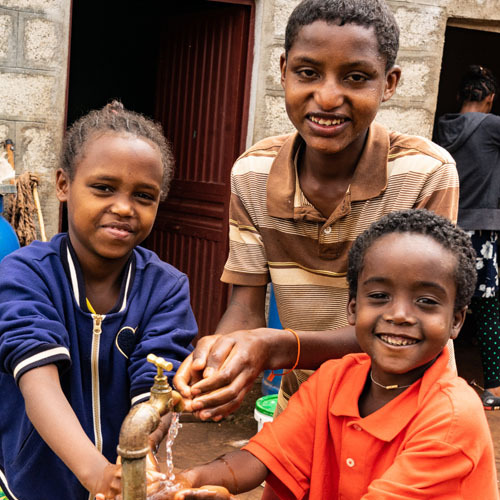 In Ethiopia more than half the population lacks access to clean water sources and 79% lack access to any type of sanitation system. ONE in FIVE children under the age of five years, die from water related disease. Many orphanages, even when using municipal water systems, have water which is contaminated with various micro-organisms that cause serious health issues in babies and young children. 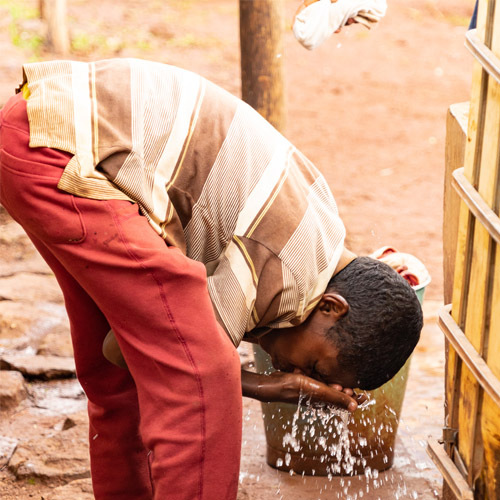 Most people collect their water from shallow open water sources that are filled with feces and parasites while others people collect water from shallow wells, which are often contaminated as rain water washes waste from the surrounding area into the shallow well. This is one reason that the sanitation issue is very important to the water issues. Both clean water and sanitation must be addressed together. Uryadi’s Village new orphanage, will be connected to the city of Sodo’s municipal water system, which can at times be undependable with regard to both purity and flow. The municipal water in the cities and towns is often contaminated with bacteria due to open storage facilities, broken pipes or a lack of adequate purification procedures, which can cause serious health issues for the babies and young children. The water flow can cease for days at a time and and often does, which makes proper water storage a necessity. In order to insure the orphanage will consistently have enough clean water, we will install large water storage tanks mounted on rooftops for gravity flow. These tanks will be filled by the municipal water system, but will provide water when the water service is interrupted. In addition, our water system will have a simple, high capacity water filter to ensure the purity and safety of the water. For irrigation needs at Uryadi’s Village a roof collection systems will be utilized to collect and store water while the overflow will be directed into underground storage features which will be built out of natural materials. Water will be collected and stored in various ways for use in surface irrigation. By creating water “sinks”, underground storage will occur, by placing woody debris, cut logs and even clay pots, deeper down under the gardens. Water will thus be stored long term and be available for plants in dryer times. Water will be collected in ponds where fish can be raised and then the nutrient rich pond water canbe used for irrigation and longer term storage in the soils. We need your help. Children need your help. Please help us provide clean water. All contributions in support of Uryadi's Village are tax deductible in the US and Canada as allowed by law. US residents please donate in USD and Canadian residents, please donate in CAD to receive your charitable donation receipts.